HeroesCon is one of our favorite shows, and we wanted to highlight some of the terrific comics creators that will be there. You can find all of our HeroesCon coverage here. 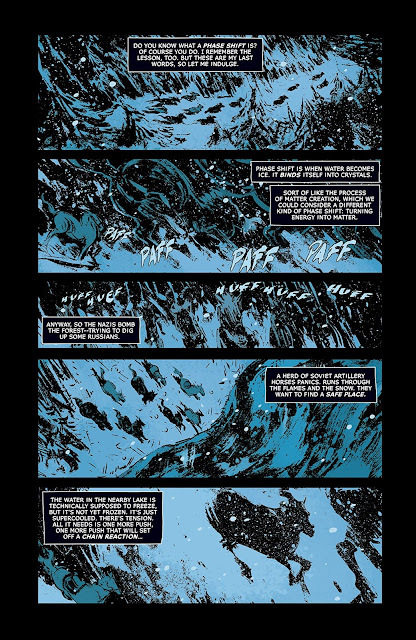 One of my favorite comics of the last 5 years or so was Zero (from Image comics), written by Ales Kot. It's a fantastic, cynical espionage series that goes off in all sorts of directions. One of the things that made Zero such a special, interesting read, was that each issue was illustrated by a different (excellent) artist (but each was also colored by the incomparable Jordie Bellaire). Issue #6 of Zero was my first contact with the work of Vanesa Del Rey, and I definitely thought "this is definitely an artist whose work I want to follow". Del Rey was illustrating an issue that took place in a cold, wind-swept wintery area, and she brought this to life perfectly. Del Rey has a rough style that works perfectly with Bellaire's colors in perfectly capturing mood and atmosphere. Her scratchy strokes create a little bit of a sense of unreality, which works perfectly for the haunting scenes being depicted. 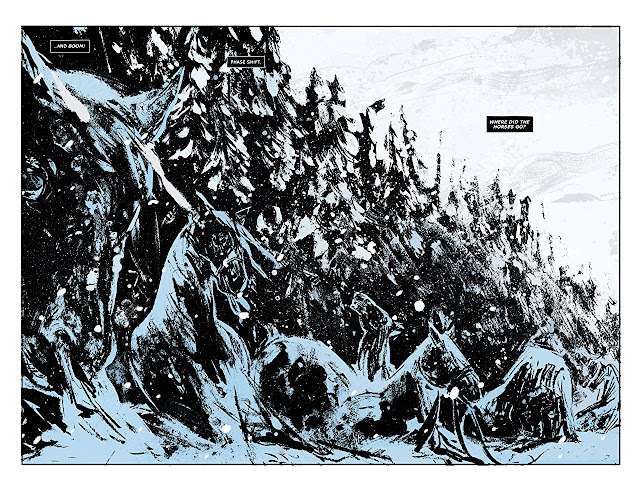 In the below panel, Bellaire uses the most subtle coloring, as Del Rey's haunting vision of frozen horses could work perfectly even without color. She has a slightly impressionistic style, but one which captures the emotional truth of people (and in this case, horses horrifyingly frozen) perfectly. Del Rey's impressionistic, rough line lends itself perfectly to stories involving the supernatural, as the world she brings to life easily feels like one that could be inhabited by fantastical being and supernatural horrors. 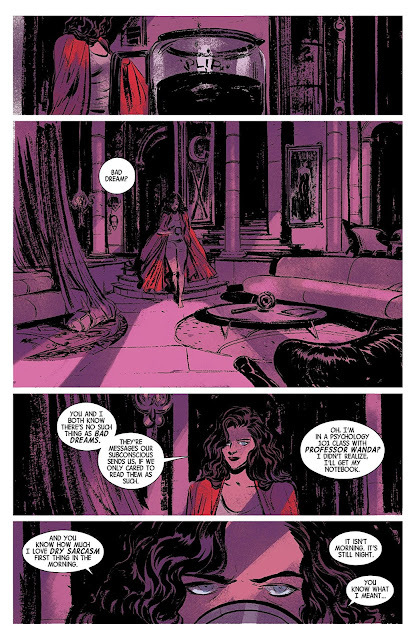 This made her a perfect fit to illustrate the first issue of the more recent Scarlet Witch series at Marvel, where the emphasis was much more on witch and Del Rey really brought this to life, once again working with Bellaire. Del Rey quickly creates a home that looks like a mausoleum, with perfect color and lighting from Bellaire to create a sense of mystery. Del Rey and Bellaire's most recent collaboration has been on the Image series Redlands, co-created by Bellaire and Del Rey (and written by Bellaire). The two of them clearly have a great synergy, and this draws on Del Rey's skill in depicting those same supernatural horrors. Del Rey brings to life a very different setting than those shows above, that of a small town in Florida years ago. As in the below, Del Rey is a master of great details such as the intricacies of the nooses hanging from a tree, and the sweat of police officers trapped inside a station. Bellaire complements this perfectly, as you can really feel the heat of the fire on the below page. 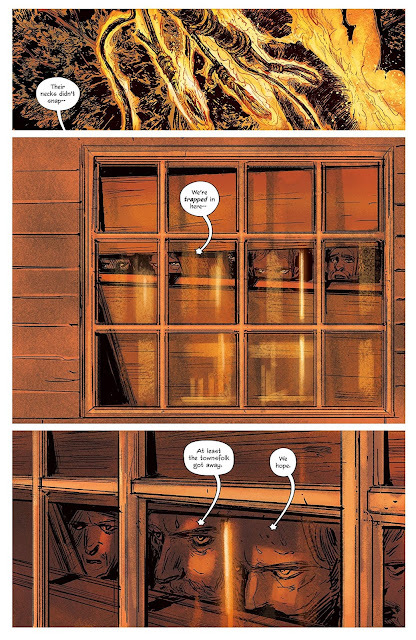 Redlands is an excellent, dark and compelling read, and a great example of a strong creative partnership. Regardless of whether you can make it to HeroesCon, I strongly recommend you check out the work of Vanesa Del Rey, and of course, that of Jordie Bellaire as well (though note that she is not one of the scheduled guests for HeroesCon).